Featuring innovative touch power/reset buttons and four 120mm white LED fans, the T3000 is an excellent choice if you are looking to show the internals of your PC. The Master T3000 from Micronics is a great chassis for housing any PC, especially if you like to display the internal components of the PC. 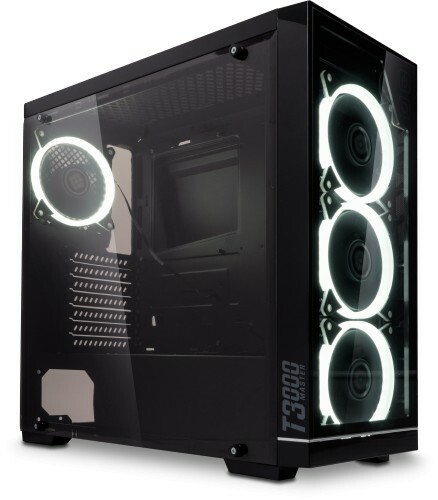 It features a tempered glass side front panel and an acrylic side panel, giving a clear and unobstructed view into the inside of the chassis. The four supplied white ring LED case fans not only help to cool the internal components but also illuminate them. There is no doubt that it's possible to build an appealing PC in the T3000 but that's not the be-all and end-all of this chassis. It needs to be able to accommodate the high-end components it deserves. 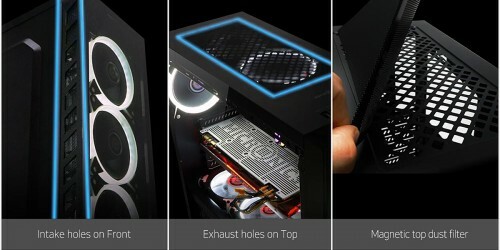 You needn't have worried as the chassis is able to hold up to five HDD/SSDs, a 120, 240 or 360mm water cooling radiator, CPU cooler with a maximum height of 160mm and finally graphics cards no longer than 410mm. It also features a PSU shroud which aids in covering up the sight of any unwanted cabling. 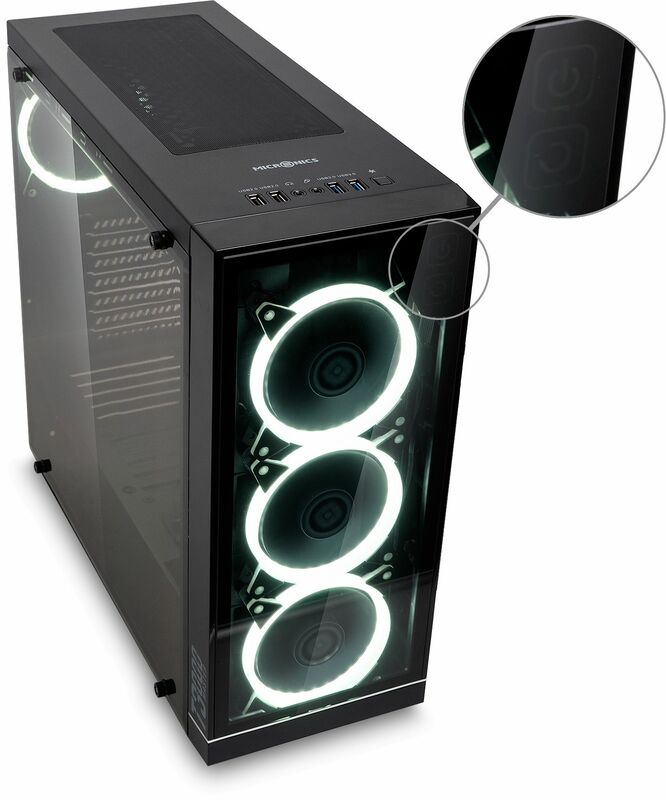 By default the chassis is supplied with four case fans (as shown above). It also has room for an additional four fans if required. 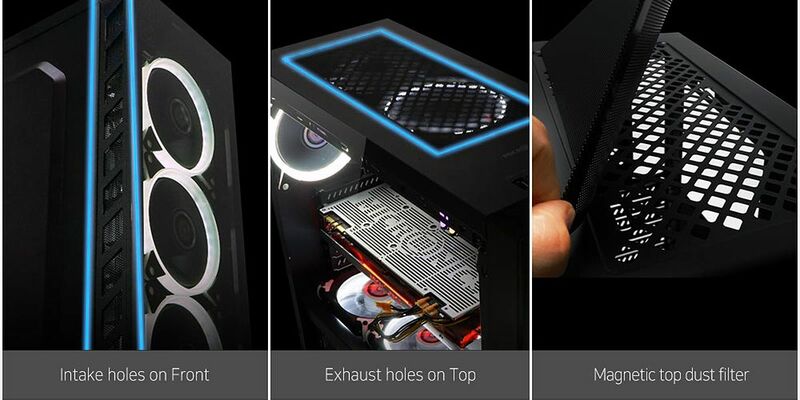 Two can be installed on the PSU shroud, to bring in cooler air from the bottom of the chassis and a further two can be installed towards the top, which are designed to act as exhaust fans. As shown in the image below there are many air intake grills, allowing for cooler air to enter the chassis. At the top of the chassis are the usual input/output ports. 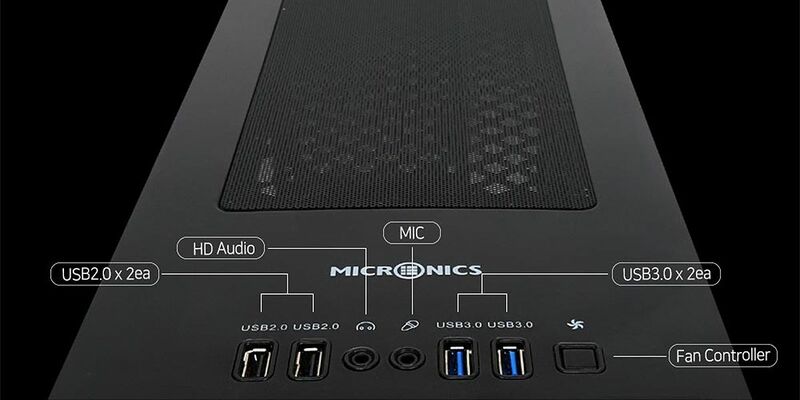 You'll find 2x USB2.0 and 2x USB3.0 ports, headphone and microphone ports and a fan switch. The fan switch allows for the fans to be turned on and off. 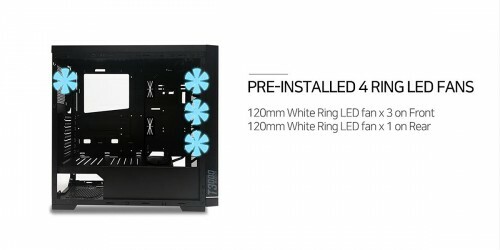 When switch off the LEDs of the fans are also switched off. The fan switch can control up to four fans. The final feature to mention is that the T3000 is not supplied with a conventional power on/off button or reset switch. In fact the chassis buttons are not buttons at all, they are touch sensitive pads at the front of the front glass panel. 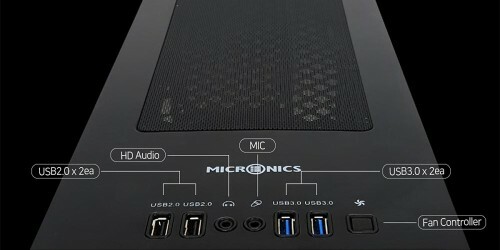 This is the first time we have seen this type of switch on any PC which adds to its unique style. Drive Bays Either 5x 2.5", or 3x 2.5" and 2x 3.5"